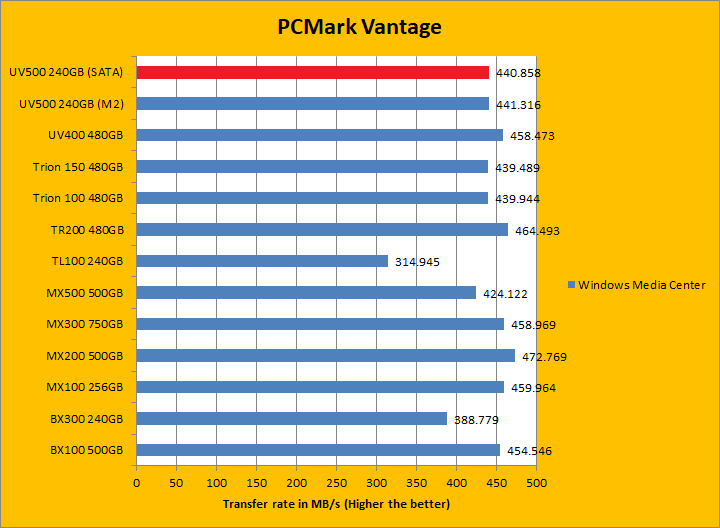 PCMark Vantage is a PC benchmark suite designed for Windows Vista offering one-click simplicity for casual users and detailed, professional grade testing for industry, press and enthusiasts. 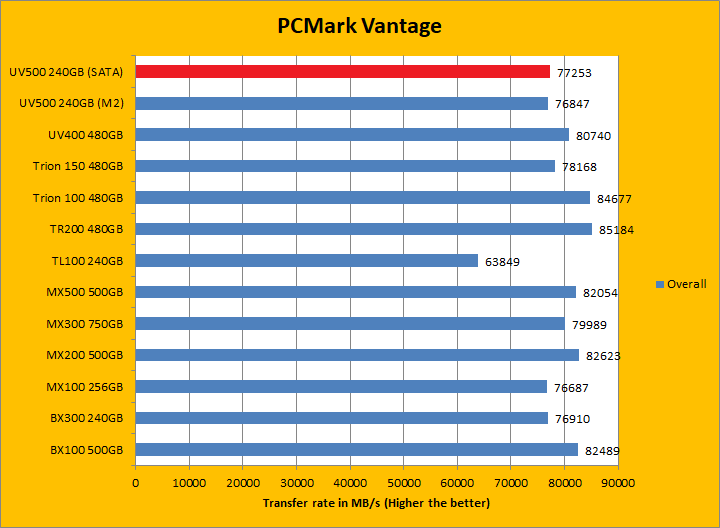 A PCMark score is a measure of your computer’s performance across a variety of common tasks such as viewing and editing photos, video, music and other media, gaming, communications, productivity and security. 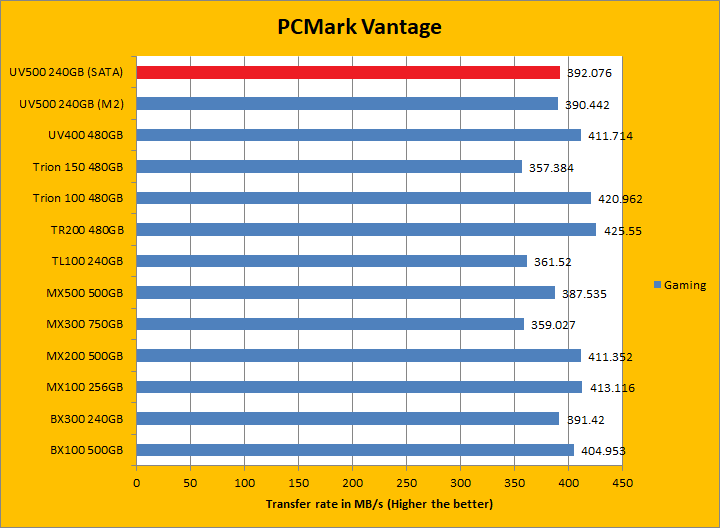 From desktops and laptops to workstations and gaming rigs, by comparing your PCMark Vantage score with other similar systems you can find the hardware and software bottlenecks that stop you getting more from your PC. 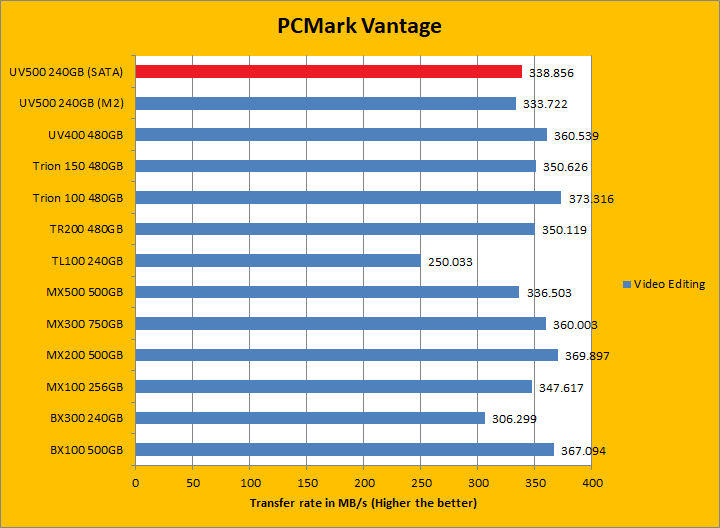 PCMark Vantage aims to shed a little more insight into real life performance of your computer hardware by semi-synthetic means -- and all insight is good, right? The great thing about standardized tests is anyone can repeat them and get very similar results, given identical hardware. 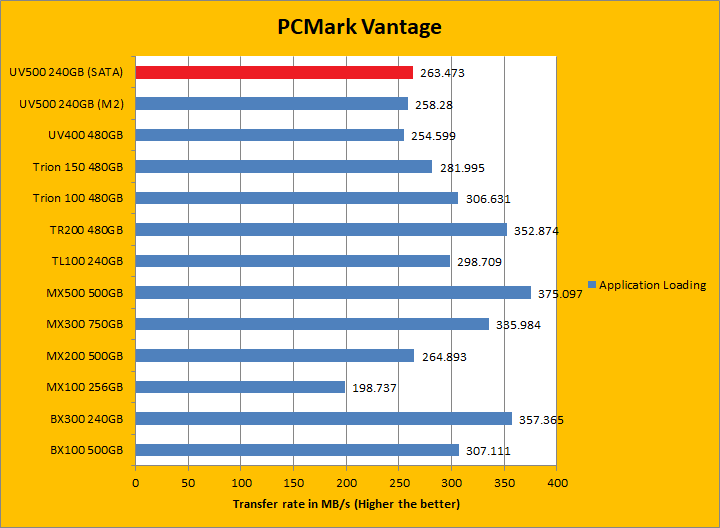 Well, I am not going to narrate the stuff above in detail, because we all know graphs are there for a very good reason. 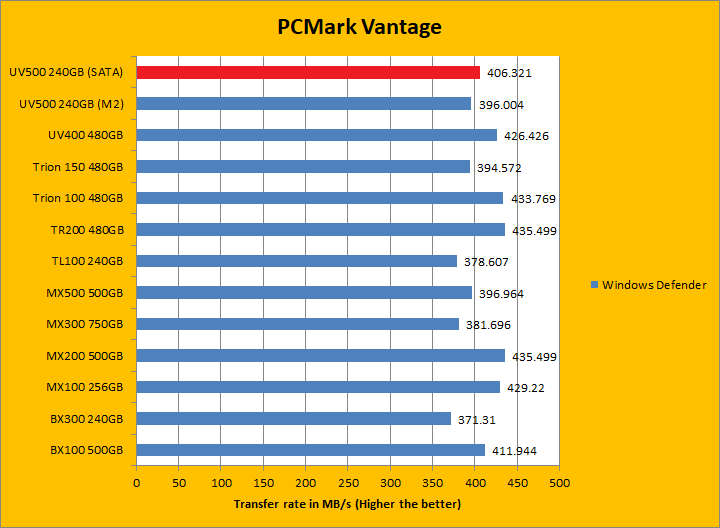 Just to give you a bit of insight if you are too lazy to go through all nine comparisons, the Kingston UV500 240GB (mSATA) came in just a hair behind the UV400, but stayed ahead of the UV500 240GB (M.2). 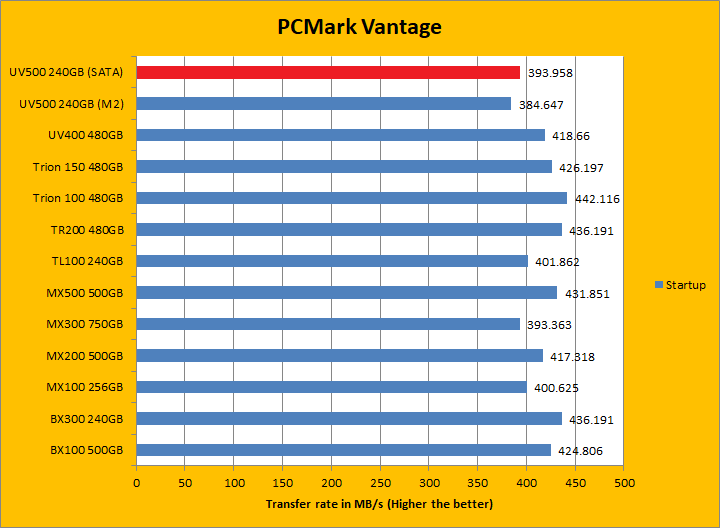 PCMark Vantage uses some pretty simple simulations, so it is pretty optimized for drives with relatively fast linear read. The results were pretty good. 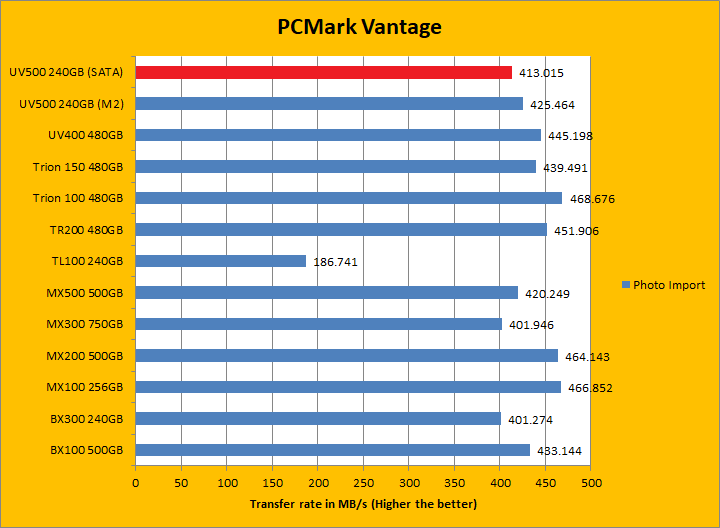 In the subcategories, the UV500 unfortunately lost all but one test compared to its predecessor, but won four of eight against both the BX300 and MX500 of various margins. 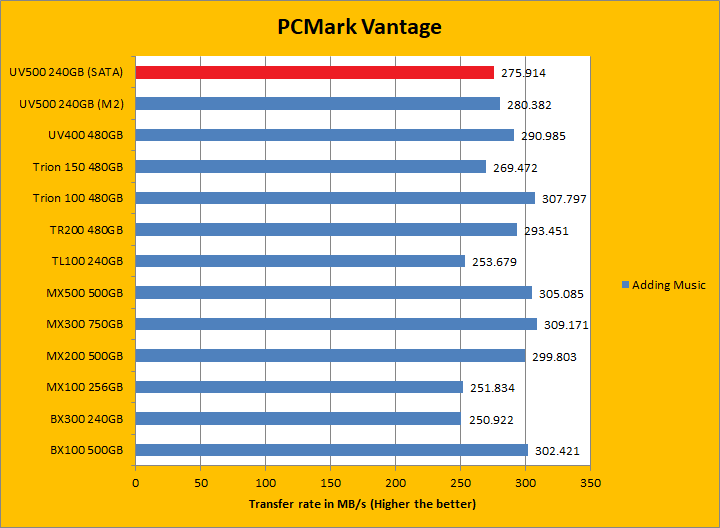 Both the BX300 and MX500 came out ahead overall compared to the UV500 though. posted 2 hours and 53 minutes ago, with 5 posts. posted 3 hours and 16 minutes ago, with 4 posts. posted 8 hours and 43 minutes ago, with 4 posts. posted 15 hours and 58 minutes ago, with 12 posts. posted 15 hours and 59 minutes ago, with 9 posts. posted 16 hours and 2 minutes ago, with 11 posts. posted 16 hours and 3 minutes ago, with 56 posts. posted 16 hours and 4 minutes ago, with 11 posts.